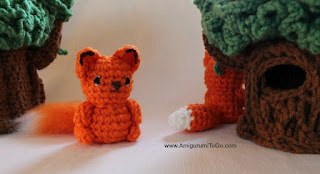 This fox is a member of the Lil' Trouble Teddies series (you'll find pattern links to the series at the bottom of this page). The only difference being his tail and the addition of color on his ears. I made him his own pattern page so you don't have to flip back and forth. There is a video that follows the written pattern of the head and body row by row here. 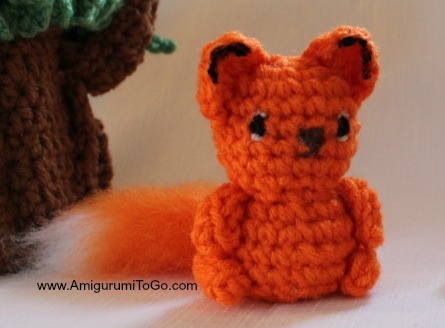 The 2nd part of the video was made before I created this Lil' Fox so his tail is not in it. However, if you need it, in the 2nd video you will find how to make the arms and legs, how to do the ears, how to add in yarn eyes and also how to sew it all together. make a Lil' Trouble Teddy or two, they will keep your hands busy and your mind occupied! at the bottom of this pattern. Thank you so much and enjoy! 4) switch to orange in first st, 1sc in next 2st then 2sc in next st then 1sc in next 3st and 2sc in next st (10) *cut free from the white and knot of yarn tails. sl st next st and f/o leaving a tail for sewing. If you brush out the tail, do not stuff. ch1 then make 3dc in next space then 3dc in next space after that . sl st just in front of the last dc you put in. f/o and shape the ear, stretch them out. Pull the yarn tails through a st in the back of the head and pull on each, this will help shape the ears a bit more. Once you're happy with how the ears look, knot the yarn tails together then hide in the head. I added a bit of black craft paint to the tips of the ears. I inserted black yarn where I thought the nose should go, wrapped a few times then made an X then hid the yarn tails in the head. The eyes are yarn again, wrapped around the 5th row. I just kept it simple so feel free to play around with it and make it more detailed. And, part two of the video for the Lil' Trouble Teddy will show you this step by step. First I'd like to thank you for all your great work. May it be repaid threefold. My kids love all the great animals I have made for them. I just finished making your tree which came out fabulous and am now starting the little fox. My only question is how you go about the tail. Is it still a crochet tail and if so, How do you brush it out? Thanks again. The tail is in the pattern, you can brush it out or you can leave it as is. In the supplies list at the top I listed a steel pet brush but you can you a piece of velcro or a hard bristled brush. The steel pet brush works faster. I brush out yarn on camera in the squirrel's video if you need. The squirrel is linked under the last fox photo on this page. Plz do that adorable lil acorn, lol!! It's just too cute! Love all ur tutorials. Thanks for all these incredible projects! I love the tree & made all the animals but, how do you stop the greenery from slulching.